This is dated from last summer but the mighty CNN put in a lot of effort to recover their payload so I re posted it. Weather balloon mystery: What went wrong? “Editor’s note: Today’s Light Years guest blogger, Mark Sudduth of hurricanetrack.com, joined a CNN project to launch a video-equipped weather balloon aimed at reaching the upper atmosphere and the edge of space. As it turned out, the mission posed many challenges. Here’s Sudduth’s account of what went right – and what went wrong. The idea is simple: Put a payload in to the very edge of space via helium balloon, track it with advanced GPS technology and recover the payload after the balloon bursts at its prescribed altitude. Sounds like an exciting idea, right? Trust me, it is. I should know because my team at HurricaneTrack.com has been working on developing just such a payload to deploy via weather balloon in to the eye of a hurricane. How would we even get to the eye of a hurricane, you ask? That’s our job. I lead a small group of people who work hard to study the effects of hurricanes at landfall. We send back live video, pictures, data and tweets during the worst hurricanes that nature can dish out. We’ve been in more than 20 of them since 1995. We know hurricanes at landfall and thought it would be really cool to see the inside of one via weather balloon. All we needed to do was add a few GoPro HD cameras, the right GPS tracking equipment and then wait patiently for the right hurricane to come along. We tested our payload with a 1,200-gram weather balloon May 24 from a private landing strip near Buffalo, Texas. The payload was made out of a $2.28 Styrofoam cooler. It provided the safety for the GPS tracking equipment, which included a G1 Android phone and a SPOT locator, which is used by mountain climbers to help rescuers find them during emergencies. We utilized lightweight aluminum cross beams that pierced the cooler to mount the four GoPro cams to, each facing a different direction. The finished product looked pretty cool. It would be hoisted to the high atmosphere by the giant weather balloon filled with more than 200 cubic feet of helium. Everything went about as well as could be expected. Despite high winds and a failed initial launch because of an insufficient amount of helium, we pulled it off. The payload, named HURR-B, went up at an average of 1,100 feet per minute. It reached an estimated 94,000 feet before bursting because of the extreme low pressure of the upper atmosphere. It then fell back to earth with its parachute slowing the descent to around 15 to 20 mph. We located it using the G1 phone and the SPOT locator and retrieved everything within two hours after touchdown. Success was the word of the day. The footage was great, the GPS loggers were perfect, and we were just about ready to launch it for real inside the eye of America’s next land falling hurricane. About two weeks ago I got a call from a CNN producer Chris Erickson asking me to advise his team on how to do something similar for a project he had with CNN International Newsource. Little did I know, this project would not go as smoothly as the previous one. I was glad to help and offered to include a new piece of equipment and the actual design of my original HURR-B payload. 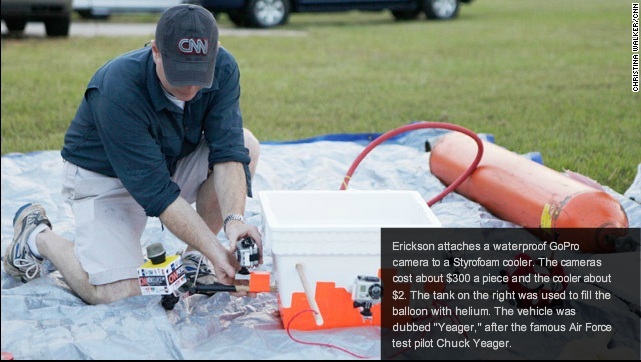 The equipment I wanted to include in the CNN payload was a Byonics APRS high altitude GPS tracking system. It uses amateur radio to send a signal with its telemetry data to HAM radio sites on the ground, which then sends it to the Internet where we can see it live. Our team member, Kerry Mallory, aka AE5JY, provided the APRS unit and would help out with the launch and the technical aspects of the APRS. We agreed on a launch date of June 23 from Falcon Field in Peachtree City, Georgia. I arrived at CNN headquarters in Atlanta on Friday to assist Desha Rogers, the subject of the project, and Chris in putting finishing touches on what became known as “Yeager.” I added my thoughts based on my experience with our one and only launch just a month prior. We worked to add a CNN microphone “flag” and a plush toy (which was made to look like a CNN satellite truck) to the payload. This would give us a nice in-camera shot of those objects as the payload lifted off. We also made sure each GoPro camera was ready. We had only one shot to get this right. Several people were going to be on hand during the early morning launch at the airfield southwest of CNN. The prep for launch went great. Desha was excited and nervous at the same time. His 8-year-old son was as curious as one could expect, a true delight to see the two interacting with everyone involved as the day finally arrived. We all worked together to attach the parachute and then fill the balloon with the helium that would provide the lift it needed to ascend to perhaps the edge of space. Desha and Kerry worked together to inflate the balloon. With the assistance of National Weather Service personnel who were on hand to launch their own sounding balloon, it was time to let Yeager go on its journey. However, there was some concern from many of us that the payload was too heavy. That concern was quickly eliminated once we tested the lift of the balloon. It pulled upwards with a respectable amount of energy. We knew for sure that Yeager would fly. The question then became whether we would find it once the balloon burst. With the crowd of international reporters watching, Desha held Yeager out and gave the countdown. He then let it go and up it went. We all cheered and congratulated the team for a job well done. So far, so good. We tracked the payload using the advanced APRS device attached inside the Styrofoam cooler. Every two minutes or so we would get a beacon that showed up on the APRS website. Yeager climbed to 10,000 feet in no time. It was really hauling. Desha and his son were relieved. Their efforts paid off. Now we waited to see how high the balloon traveled before it would burst. That news arrived from one of our colleagues who was tracking it from Nevada. Something had gone wrong and the balloon burst at around 66,000 feet. To most people this would be great news. Not for us. We wanted 100,000 feet or more. Perhaps the balloon was over-filled with helium, which would cause it to burst much sooner. Perhaps it had a defect. We didn’t know for sure. It took only a few minutes for it to fall back to earth. This was not a good sign. 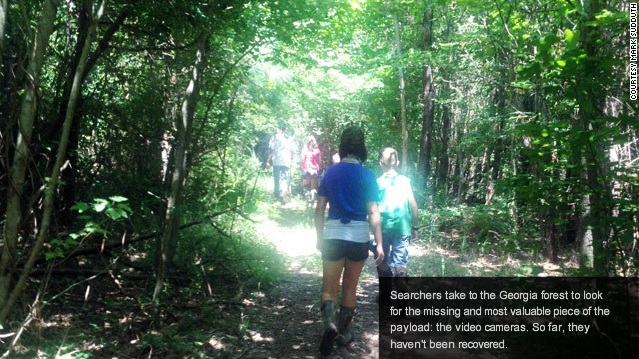 The satellite tracking system, the SPOT locator, indicated a landing near Griffin, Georgia, perhaps next to a stream in some woods. The APRS showed its last report from over a mile away. Why the discrepancy? We would soon find out the bitter answer. We came upon the SPOT locator attached to a heap of parachute and balloon, mixed in with parts of the frame of the payload. However, there was no payload. It was not there. The SPOT locator led us to it, but where was the cooler? Where were the GoPro cams? The APRS? The G1 phone? Now that the payload was on the ground, why wasn’t the G1 sending out its location? It should have been seeing the local cellular network and been reporting its location every 45 seconds. We heard nothing from either the APRS or the G1. This was quite a blow to our spirits. For me, I wanted to know why. Why did the payload separate from the parachute? The answer was obvious. The balloon burst was not complete enough to shred it, leaving only a small amount of latex behind. Instead, almost the entire balloon was still attached to its rope. This acted to smother the much lighter parachute and prevent it from opening. This meant the payload and accompanying balloon/parachute combo fell to earth very quickly. The cords became so twisted that the torque broke the frame of the payload and ripped it right out of the cooler. This caused the cooler to fall somewhere else while the tangled mess of balloon and parachute fell where we found it with the SPOT locator still zip-tied to the wooden dowel, perfectly intact. The CNN folks had to get back to Atlanta. I was determined to remain behind with Kerry to find the payload. We searched nearby woods and fields based on what we knew from the last reported position of the APRS unit. After about two hours, no luck. Then our colleague from Nevada, Paul Bowman, called me exclaiming that the G1 had just updated! It was alive! He said it was in someone’s house. We went to that location with the aid of the local Sheriff’s department to ask the homeowner if he had seen the payload on his property. The owner, Justin Garrett, said he had not. I mentioned that we had a G1 phone that had just reported in and he perked up and said, “I found a cell phone in my back yard just a while ago.” We were stunned. He had stumbled across the G1 phone in his back yard while mowing. He turned it on to see who it belonged to. Doing that meant that it would send a signal “home” and Paul then knew right where it was. Talk about an incredible coincidence and timing. We knew the rest of the payload was not far away. After spending the rest of the afternoon working with the Garrett family to search all over their property and the adjacent woods, we realized that perhaps, just perhaps, the APRS device was still beaconing. After all, the batteries would likely power the unit for another week or more. Kerry fired up his handheld amateur radio to “listen” for the beacon. Within minutes, we heard it. Yeager, or at least the APRS unit, was alive and well somewhere nearby. We noted the latitude and longitude of the reported position and trekked in to the deep woods to search. We spent several more hours battling heat, humidity, ticks, snakes, spiders, thorns and mud trying to locate the wayward payload. No luck. Kerry’s handheld indicated that we were within a few hundred feet of it, but the thick forest (and the snakes) were too much as the day came to and end. We were utterly exhausted and called off the search just before sundown on Saturday, some 12 hours after we were as cheerful as kids on Christmas morning. Now we felt defeated and still wondered what went wrong. After I returned home to North Carolina and Kerry went back to Alabama to spend time with family there, we had a chance to think more clearly about the situation. We had several clues. The G1 was in hand and we knew exactly where it landed. We had the SPOT locator and knew where it had landed. We also had the reported position of the APRS unit which was somewhat in between the two other pieces of the puzzle. Paul worked to further refine the GPS data and updated Kerry and me with a new position estimate. Paul was 100% certain that the GPS info was correct. The position we were looking for on Saturday was off by only a few hundred feet, but in those dense woods that was huge. And so we shall this Friday, to search again with fresh data and renewed energy. We’ll also have proper equipment, plenty of water and the will power to not leave until we find at least the APRS unit. It’s a needle in a haystack, but the advantage is that the needle is telling us where it is.